New and returning Dragon Quest series content awaits players! The hit mobile RPG Final Fantasy Brave Exvius celebrates the long-awaited launch of Dragon Quest XI: Echoes of an Elusive Age with an exciting in-game Dragon Quest Series collaboration starting today. In addition to new content, this collaboration also brings back past limited-time Dragon Quest series content for all players to enjoy. The mighty Estark awaits players who are ready for a challenge and seeking generous rewards, now through September 20,2018 in a new raid event. Players can also add Estark, Uberkilling Machine, and Slime Knight to their ranks through a new featured summon. 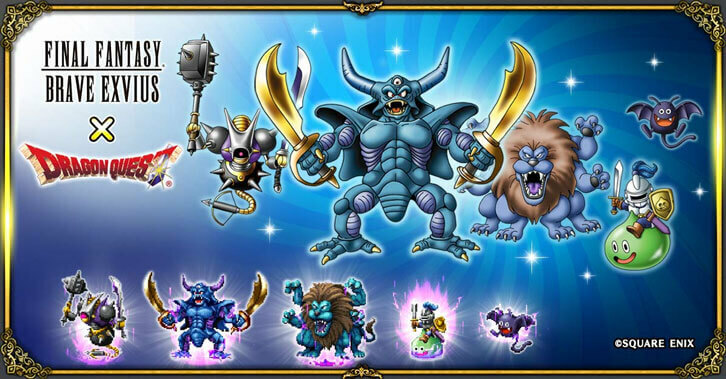 The iconic Marquis de Leon, Dracky, and Slime units will also be available to players through a raid summon.